"Millipede" means a thousand legs. The slow-moving millipede doesn't literally have a thousand of these appendages, but their bounty of legs is what people tend to identify them by. Millipedes are generally useful, spending their days eating dead and decomposing plant and animal matter, which helps to recycle nutrients in forests, deserts and other areas. 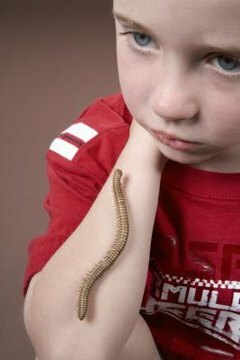 Although they are sometimes confused with centipedes, similar looking many-legged creatures, millipedes have aspects that make them unique. According to The Field Museum of Chicago, the 16 orders of millipedes together contain almost 12,000 different varieties. These multi-legged creatures are arthropods, closely related to but different from insects. Millipedes sometimes end up in homes and garages but don’t appear to seek out these places; you can keep them out of your home by keeping your garage, basement and other areas dry and free of debris. They don’t have any venom, but some types excrete a protective chemical substance that might irritate sensitive skin. The millipede’s head is on one end of his body and is about the same diameter as the adjacent segment. Springing out from his head are antennae that help the millipede to sense what’s around him, though these are so short they can be hard to spot. The jaws are on the front of his head and the millipede’s eyes are set above his jaws. Most millipedes have simple eyes that provide basic vision, but not all types of millipedes have eyes. Millipedes are made up of a series of segments connected in a long row. The number of these varies greatly from one type of millipede to another. Many of the segments contain special glands that secrete a noxious chemical to repel predators. The first segment, called the collum, sits directly behind the head and is without legs. Then rest of the segments have legs, until the end, where some of the segments have no legs. The number of the legless segments varies. Some types of millipedes have hair or spiny appendages protruding from their bodies. The legs are under the millipede's body, unlike the centipede, whose legs protrude out flat on both sides. Millipedes use most of these for locomotion, but some legs have specialized functions. Males sometimes have legs modified for mating or for delivering a sperm packet to the female. A female typically has a pair of vulvae directly behind one pair of legs where she can receive the sperm either directly from the male or by using her own legs to pick up the sperm packet from the ground.